Because price matters when buying, well, anything, our first tip covers ETF pricing and three considerations to help you buy at the right price. Use limit orders. When buying ETF units, you can choose to place a “market order” or a “limit order”. A market order will place the trade as soon as possible at the best price available at that moment, while a limit order ensures that if an order is filled, it will be filled at the specified price or better. Market orders provide greater assurance that your order will be filled, but with the risk of price uncertainty. As an example, let’s assume an investor wants to execute a market order to buy 25,000 shares of ETF ABC. Let’s also assume the order book for ABC (see exhibit 1) at the time of trade displayed 6,000 shares on the bid/ask with a quote of $25.09/25.11 and another 20,000 shares on the bid/ask with a quote of $25.05/$25.15. If the market order was executed, the investor would receive the first 6,000 shares at $25.11 and the remaining 19,000 shares at $25.15, for an average price execution price of $25.14. Had the investor used a limit order, they could have protected the order from the deviation in the fill price by allowing market makers time to refresh their quote and offer up additional shares in the secondary market (See “Volume does NOT equal liquidity. Here’s why” for more on the role of market makers in ETF trading.) Limit orders are not without risk though, as there is a chance that the order will go partially unfilled at your specified price. Market orders do have their place, however, for some investors – they may make sense for small trades in highly traded ETFs or in situations when making the trade is urgent, regardless of price. Generally speaking, however, the limit order is the preferred purchase method for most situations. Use bid/ask to determine current price, not the last trade price. Simply looking at the price of the last trade to determine the current market price of an ETF can be problematic. Many ETFs may not trade that often, especially newly launched ETFs. This can cause the last traded price to be stale. Instead, reviewing the current bid and ask prices is better representative of the current value of the ETF. For example, Exhibit 2 shows us a historical price screen for PIB, our newly launched PowerShares 1-10 Year Laddered Investment Grade Corporate Bond Index ETF, on November 28, 2017. The last traded price for the ETF was $20.06, which was executed on November 13, 2017. 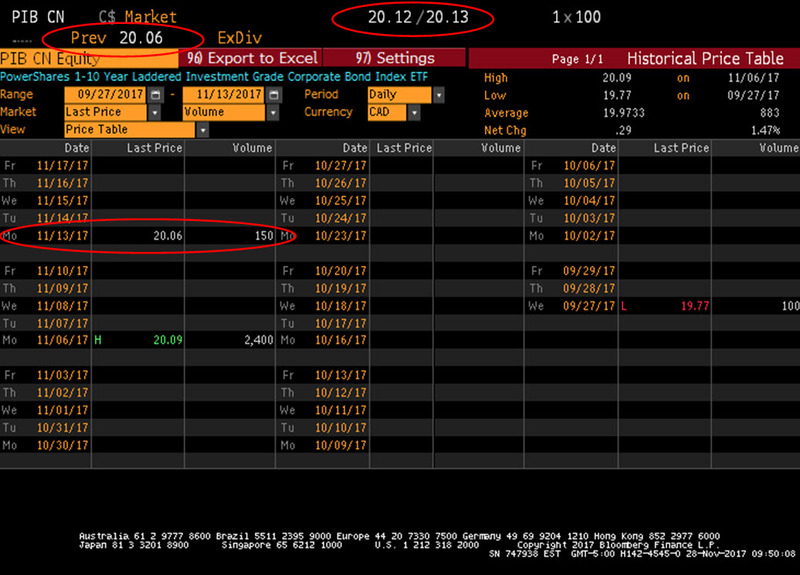 However, the bid/ask for the ETF at this point in time was $20.12/$20.13. Source: Bloomberg L.P., as at November 28, 2017. For illustrative purposes only. Use a consolidated market view. There are many venues on which Canadian-listed ETFs may trade. Depending on your market data feed, you may be seeing only a fraction of the total trading volume, along with stale pricing data. For example, let’s look at our TSX-listed PowerShares 1-5 Year Laddered Investment Grade Corporate Bond Index ETF (PSB), and the data that you may have seen on the widely used Thomson ONE terminal (see Exhibit 3). Source: Thomson ONE. For illustrative purposes only. The first row shows the default data that is shown to most investors, which is trading and pricing data that has occurred on the TSX. The second row shows a consolidated quote across all trading venues in Canada. The bid/ask size and total traded volume are higher in the consolidated quote. Based on total volume traded on that day, the TSX quote represents only 24% of the consolidated quote. Note also that the last traded price on one trading venue could be stale if only a certain share of the trades occurred on that exchange. A consolidated picture would provide the most up-to-date bid, offer, and last price based on trading of the security on all trading venues (See “Is your ETF trading data accurate?” for more on consolidated market data). This is the first of a series of blog posts looking at ETF trading best practices. In my next post, I’ll look at the importance of timing when buying or selling ETFs – particularly in certain markets. The PowerShares ETF Capital Markets trading desk supports our clients with execution of their ETF trades and any pre-trade questions. We are available to advisors for trading and liquidity guidance. To get in touch with our ETF Capital Markets team, please contact your PowerShares Sales rep at 1-800-261-8689 or e-mail us at capitalmarkets@powershares.ca. This document is for informational purposes only and does not constitute a recommendation of any investment strategy or product for a particular investor. Investors should consult a financial advisor/financial consultant before making any investment decisions. The opinions expressed are those of the authors, are based on current market conditions and are subject to change without notice. These opinions may differ from those of other Invesco investment professionals. Ordinary brokerage commissions may apply for ETF buy and sell transactions which may increase the cost of trading in ETFs for an investor. A good guide for where you may set your limit price is to look at where the current bid/offer is on the ETF you are looking to trade. If you are buying, a limit order near or at the current ask price is good practice. If you are looking to sell, a limit near or at the current bid price is best. The trade-off with any limit order is that there is a chance that the order will go partially unfilled at your specified price. If we choose a limit order, then how much will the specified price be? What are the limitations here?